Like all Volvo models, the XC90 features a comprehensive safety package designed to protect occupants in a wide variety of accidents. Given the higher centre of gravity of an SUV, however, there has been a greater focus on the increased potential for roll-over accidents. A stability-enhancing system, Roll Stability Control (RSC), minimises the risk of the new Volvo XC90 rolling over in the first place. Increased protection is provided for occupants if the vehicle does roll over. Owing to its higher centre of gravity, an SUV may have a higher risk of rolling over in certain critical situations compared with a conventional car. That is why the centre of gravity in the Volvo XC90 has been kept as low as possible compared with most SUVs. In fact, it is just 89mm higher than that of the Volvo XC70. However, this does not mean that Volvo has compromised on one of the properties that SUV buyers value so highly: a commanding seating position. In order to help reduce the risk of a roll-over situation, Volvo has developed an active stability-enhancing system known as Roll Stability Control (RSC). The system uses a gyro-sensor to register the car's roll speed and roll angle and instantly calculates the terminal angle and roll-over risk. If there is an obvious risk of rolling over, the DSTC (Dynamic Stability and Traction Control) anti-skid system is activated and responds by reducing the engine's power and braking one or more wheels as necessary until the car understeers and stability is regained. This significantly helps reduce the risk of a roll-over accident initiated by extreme manouvres and is the only active stability-enhancement system to measure the car's roll angle. If the Volvo XC90 experiences a roll-over, the passive safety systems kick in. The goal is to reduce the risk of occupants' heads coming into contact with the car's interior roof panel or sides. So, Volvo has reinforced parts of the roof structure in the Volvo XC90 with extremely tough Boron steel, which is four or five times stronger than normal steel. All seven seats are equipped with seat belt pre-tensioners to hold the occupants securely in place. In an accident, the pre-tensioner pulls the seat belt firmly across the occupant's body in order to help provide maximum protection. To help prevent the head from striking the car's sides, the Volvo XC90 is equipped with Volvo's Inflatable Curtain (IC). IC also helps prevent the occupants or any limbs from being thrown from the car in an accident. In the Volvo XC90, the IC protects all three rows of seats. The Volvo XC90's IC is specially adapted to stay fully inflated for longer to offer maximum protection in a roll-over scenario. If the occupant's head is resting against the window at the moment of inflation, the curtain will slip between the glass and the occupant's head. The problem of compatibility - when an SUV collides with a car that sits closer to the road surface - was another important focus throughout the development of the Volvo XC90. A typical SUV has a high ground clearance and thus often comes with high-positioned bumpers. This may create a greater risk of damage to the oncoming car and more serious injuries to its passengers as the lower car's protective beams and crumple zones simply slip below the front of the SUV without being activated. In order to reduce the risk of this type of injury, the Volvo XC90's front suspension subframe is supplemented with a lower cross-member neatly concealed behind the front spoiler and positioned at the height of the beam in a conventional car. The lower cross-member strikes the oncoming car's protective structure, activating its crumple zone as intended so the occupants can be given the maximum level of protection. Considerable attention has also been given to the safety of pedestrians, cyclists and other relatively unprotected road-users. The entire front of the car features clean, gentle and smooth lines, and there are no protruding parts that may cause injuries. 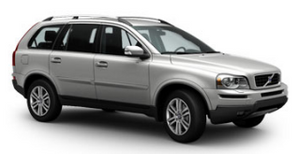 The engine in the Volvo XC90 is installed low in the vehicle. As a result, the bonnet has no less than 80mm of deformation space before there is any contact with the engine below it. It thus serves as a soft, impact-absorbing 'bumper', reducing the risk of serious injury if a pedestrian is thrown onto the bonnet. The Volvo XC90's third row of seats provides a high level of passenger safety. There is generous space behind it, so collision force in a rear-end impact can be effectively absorbed and dissipated. The occupants of the rearmost seats sit just above the rear axle, which is the optimum position in terms of side-impact safety. These seats also feature seat belt pre-tensioners, head restraints and protection from the Inflatable Curtain. WHIPS, Volvo's award-winning Whiplash Protection System, is fitted in the two front seats of the new Volvo XC90. WHIPS is activated in the event of a rear-end collision from speeds as low as 9mph, helping to reduce trauma on the spine and neck and thus reducing the risk of injury. An integrated booster seat is standard in the centre seat of the middle row, as are ISOFIX mounting points, and Volvo also offers a passenger airbag cut-off switch to enable child seats to be carried in the front of the car. This glass is also available for (laminated) side windows. On the side windows, the WRG gathers water together as pearls of moisture that are easily blown away by the wind, leaving a dry glass panel with unobstructed visibility. Since it is more difficult for dirt to fasten onto dry surfaces, it is also easier to keep the windows cleaner. The WRG treatment requires that the windows be laminated. Volvo was the first car manufacturer to improve driver comfort by studying ergonomics and introducing adjustable lumbar support seat backs in 1964. After nearly 40 years of continuous research, crash-testing and innovation, it can also claim that its seats can reduce whiplash injuries by 50 per cent. Seventy per cent of personal injuries in car accidents include whiplash, but Volvo's research shows this risk can be reduced by half with 'WHIPS' - the Volvo Whiplash Protection System, first introduced at the launch of the S80 in 1998, and now standard in all Volvo front seats. Volvo's WHIPS seats significantly reduce the force on the spine and head by absorbing energy from the impact and offering superior support thanks to the combination of an innovative moving support mechanism in the seat back and a fixed head restraint design permanently at the right height and position. In practice, the WHIPS seat mechanism bends backwards with the occupant's body - first in parallel and then in a short reclining movement.